The present issue is dedicated to the problem of living after the war ends — what happens when the guns become silent and both the winners and the losers need to communicate and continue their co-existence under realities of peace. How to overcome the negative past of deep conflicts and wars, how much time must pass to do this, how and when in history one have solved or failed to solve this challenge of peace and how to shift various spheres of social life to peaceful co-existence after “hot” and “cold” conflicts between various peoples in the past. 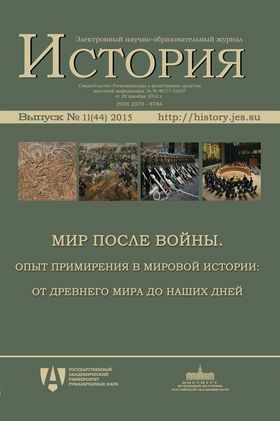 The first part of articles deals with concrete examples of historical experience from various times written by participants of the research grant of the Russian Humanitarian Scientific Fund 13-01-00305 “Historical reconciliation in the World History: from Ancient World to the present”. It includes the studies on ancient Babylon (Alexander Nemirovsky), Religious wars in France in the eyes of contemporaries from Russia (Pavel Ouvarov), Russian-French image de l'autre after the War of 1812 (Nikolai Promyslov), French-German post-Second World War relations (Marina Arzakanian) and Soviet-German relations in the second part of the 20th century (Alexey Filitov). The second part unites the articles of authors from various research centers of Russia — from Surgut to Moscow and Saint-Petersburg. The core of them is dedicated to the issue of preventive diplomacy, crisis management, detente of tensions and peaceful ways of competition (both in Western and Eastern Europe) in the New and Modern times of history. Struggling for “European Historical Consciousness”: Can a New Supranational History of Europe Teach Non-Conflict Reading of Shared History?